Welcome Chloe and Matyas to the Zocket team, our newest interns! 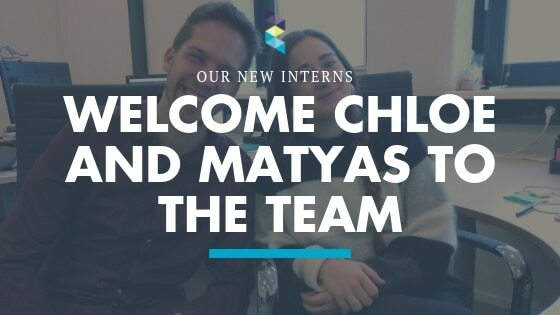 Zocket is excited to have two new team members onboard—Matyas, Graphic Design Intern and Chloe, PR and Communications Intern. Matyas will be with us for 4 months, and Chloe for 3 months, learning as much as they can and having a fun time while doing it. A native of Hungary, Matyas moved to the Netherlands to attend The Hague University of Applied Science just over two years ago. He was inspired to move after two of his siblings moved to attend the same university and loved living here in the Netherlands. He is responsible for all things graphic design, creating visual materials for the brand as a whole, including the website and social media. So far, he is enjoying the ride. Chloe was born and raised in California and came to the Netherlands to pursue a master degree in Media & Business. She recently graduated and sees the internship as a great way to bridge the gap from formal education to the beginning of her career. She brings with her knowledge of media, communications, and past internship experience at a PR agency. Thus, she is responsible for copywriting, communication with journalists, and helping to manage social media. When asked about their experience of Zocket’s company culture, Matyas and Chloe said that they love the working environment and flat hierarchal structure. Additionally, they feel that interns at Zocket get more responsibility. Outside of work, Chloe and Matyas both like to travel as much as they can and spend time with friends. Matyas views traveling as a chance for him to meet new people and create new networks, and he enjoys creating new friends all over the world. Chloe loves to immerse herself in new cultures and try different cuisines that push her outside of her comfort zone. The Zocket team is proud to have two new motivated minds with us for the next few months. Welcome, Matyas and Chloe! Are you our next intern talent? Reach out to us if you are looking for a chance to shine.